Also serving communities of Tahoka, Levelland, Littlefield, Crosbyton, Plainview. The average cost of assisted living in Lubbock is $3,128 per month. This is lower than the national median of $3,346. To help you with your search, browse the 65 reviews below for assisted living facilities in Lubbock. On average, consumers rate assisted living in Lubbock 4.3 out of 5 stars. Caring.com has helped 9 families in Lubbock find high-quality senior care. To speak with one of our Family Advisors about assisted living options and costs in Lubbock, call (855) 863-8283. Nicknamed "Hub City" because it is a regional center for health care, education and the arts, Lubbock offers seniors easy access to quality entertainment and medical services. For those considering a move into assisted living in the Lubbock area, there are at least 14 different facilities to choose from in Lubbock, with more available in neighboring cities such as Canyon. In Lubbock and throughout Texas, the Department of Health and Human Services licenses two different types of assisted living facilities (ALFs). Type A facilities are for residents who don't need regular nighttime assistance and can follow directions if there is an emergency. Type B facilities care for residents who need overnight attendance, can't follow emergency instructions and need help to evacuate. Both types of facilities offer services including meals, dressing and medication assistance in a homelike setting. • Lubbock's climate tends to be sunny and arid, with hot summers and chilly winters. High temperatures in the summers average 92 degrees, while winter lows are around 26 degrees. Besides occasional extreme temperatures, Lubbock is a great place for seniors who enjoy changing weather patterns. • Lubbock is an affordable city where seniors can enjoy a cost of living that's 15.90 percent less than the national average. • Texas is one of just seven U.S. states with no state income tax, which means that retirement income is tax-free. • Lubbock provides public transportation throughout the city by Citibus and a paratransit system called Citiaccess. Seniors who are at least 65 years of age or disabled can qualify for reduced fares. • From celebrations of its western heritage to wineries to live entertainment, Lubbock's diverse art and culture scene has something to offer almost every senior. • The Lubbock area is home to world-class medical facilities, including University Medical Center, in the event of medical emergencies or illness. Assisted Living costs in Lubbock start around $3,128 per month on average, while the nationwide average cost of assisted living is $4,000 per month, according to the latest figures from Genworth’s Cost of Care Survey. It’s important to note that assisted living rates in Lubbock and the surrounding suburbs can vary widely based on factors such as location, the level of care needed, apartment size and the types of amenities offered at each community. For many seniors, the costs associated with assisted living are a major concern. Fortunately, financial aid is available for those who qualify. 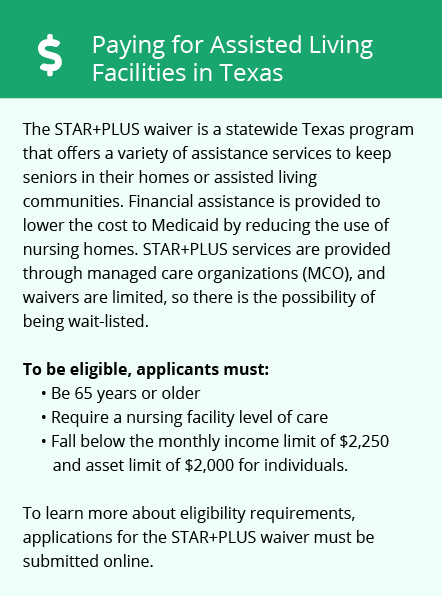 Texas' Health and Human Services Commission operates a Medicaid program called STAR+PLUS. 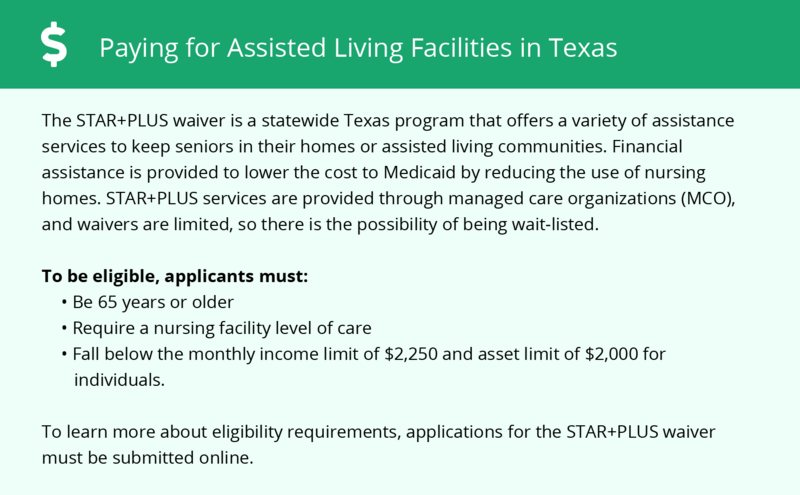 For eligible seniors who are at least 65 years of age or disabled, STAR+PLUS offers an alternative to nursing facility placement and may pay for assisted living services. Lubbock and the surrounding area are home to numerous government agencies and non-profit organizations offering help for seniors searching for or currently residing in an assisted living community. These organizations can also provide assistance in a number of other eldercare services such as geriatric care management, elder law advice, estate planning, finding home care and health and wellness programs. To see a list of free assisted living resources in Lubbock, please visit our Assisted Living in Texas page. Lubbock-area assisted living communities must adhere to the comprehensive set of state laws and regulations that all assisted living communities in Texas are required to follow. Visit our Assisted Living in Texas page for more information about these laws.